Prince Andrew visits Moryvia to present them with an award and name a helicopter. The Duke of York visited Morayvia yesterday to present the attraction with the Queen’s Award for Voluntary Service – the highest award possible for groups. The Kinloss-based organisation was formed in 2011 with the mission of saving one of the Nimrod’s that was due to be scrapped. Now about a dozen aircraft sit on the forecourt outside the former school – including the iconic Sea King helicopter. 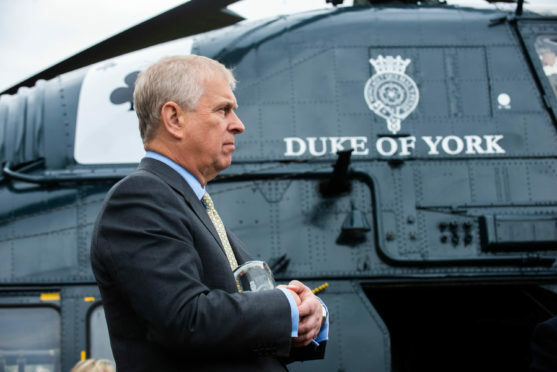 Yesterday, a Wessex helicopter, bedecked in Royal Navy colours, was christened Duke of York in honour of Prince Andrew’s visit to the aviation centre. And the former Navy man, who co-piloted Sea Kings during his military career, praised the commitment of the volunteers to showcasing the aircraft that have flown in the sky above Moray. Prince Andrew said: “The RAF has an enormous heritage at Kinloss. It’s absolutely outstanding to have a place like this just over the fence from where the base was. “The Nimrod will shortly be replaced by the P-8 Poseidon which means the maritime patrol activities that took place here will continue at RAF Lossiemouth. During his visit to Kinloss, Prince Andrew inspected the inside of the Wessex, which has been decorated with an ace of clubs emblem from 771 squadron before a longing look at the attraction’s Sea King, which he flew during the Falklands War. The Duke of York is now the second aircraft belonging to the group named after a member of the Royal Family, joining the Nimrod christened Duke of Edinburgh. Mark Mair, chairman of Morayvia, said: “I showed the duke a picture of the Wessex when I was introduced to him at a garden party and asked if we could name it after him.